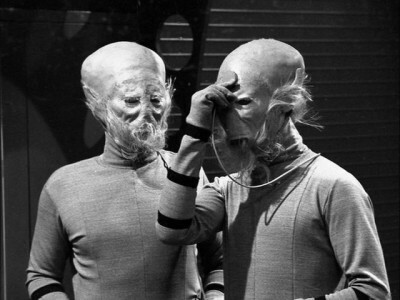 The penultimate serial in the first season of Doctor Who, The Sensorites is something of an anomaly. It doesn't have the excitement associated with the first stories, a big name writer associated with it, or even an exotic location like the previous story, The Aztecs. 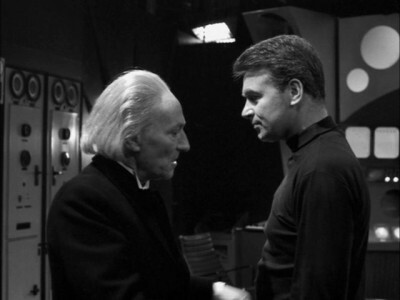 A more sedate adventure, this serial is often overlooked by fans and as Toby Hodoke notes in one of the extras, it didn't even have the decency to be wiped by the BBC so we could all sit around and bemoan how great it must have been. Now that it's been released on DVD in region one, how does it measure up? Pretty well actually. While it's not an undiscovered masterpiece, there are some excellent elements that make this solid adventure well worth watching. When the TARDIS materializes, Susan, Barbara, Ian, and the Doctor find themselves inside another spaceship. They discover the crew slumped over the controls and quickly determine that there are no signs of life and that they're dead... only to be surprised when they start to groan and wake up. 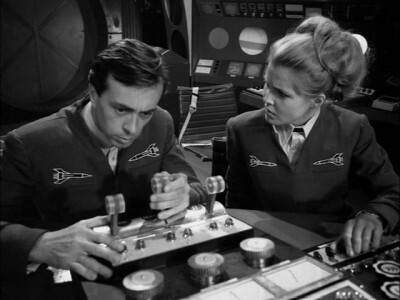 It turns out that the Captain, Maitland, and his first office, Carol Richmond, had their physical processes slowed to imperceptible levels by the Sensorites, the being who inhabit the planet they're orbiting, known as the Sense-Sphere. The Senorites have been controlling their minds ever since the ship's geologist and Carol's fiancée, John, became excited about something he'd discovered. A discovery that drove him crazy. He now wanders the ship, raving. Realizing that new travelers are on the ship in orbit, the Senorites sneak about the vessel and steal the lock to the TARDIS, preventing anyone including The Doctor from opening the door. Trapped, they have no recourse but to help the crew and figure out both why the Sensorites have locked the ship in orbit and how to get them to release it. The travelers are aided in their quest quite a bit by The Doctor's granddaughter, Susan. It's revealed that she has enhances psychic abilities and can communicate telepathically with the Sensorites. Once communication has been established, The Doctor, Susan, and Ian travel down to the Sense-Sphere along with John and help the Sensorites out with a couple of problems of their own, including stopping a group of terrorists and ferreting out a traitor. Seen today, this seems like a pretty standard story. The travelers have to help the people they encounter because they can't access the TARDIS. How many times have we seen that? Not all that many, at least not when this story first aired. Yes that plot device does get tired and over-used quickly, but during this first season you really couldn't say that. The story itself was well constructed too. Many six-part adventures seem drawn out, but this one feels more like two stories that were welded together seamlessly. The first couple of episodes take place on the spaceship and deal with the mystery of the Sensorites themselves. After that, the narrative switches to the planet's surface where a whole new set of problems crop up (the Sensorites are dying of a mysterious illness while members of the government are plotting against The Doctor and his companions who are only trying to help.) This works well and keeps the action flowing nicely. The set designs, especially those of the spaceship, were very good and well thought out. The ship wasn't a gleaming steal and glass structure, but it had a grimy, old, almost claustrophobic feel to it. The large round doors were a nice touch too, the whole effect served to set this ship apart from most of the other spaceships of that time. Susan's expanded role was another nice aspect of this serial. She played a pivotal role rather than being a hostage or someone to say "what do you mean grandfather?" So, why isn't this adventure more fondly remembered? The main reason is that there's nothing special about the aliens or the situation. While the first couple of episodes were mysterious and to a large extent unique, after they go to the Sense-Sphere the story becomes very pedestrian. It could have even been set on Earth for that matter. The only unique ability the Senorites have is that they can communicate via telepathy, something that they do rarely, and it's only about as useful as having a walkie-talkie. The other elements of the tale have nothing fantastic or alien at all. Even the Senorites weakness of loud noises doesn't really come into play. A few times they cringe when The Docotr raises his voice, but they frequently yell at each other. With just a little bit of tweaking, a few more other-worldly aspects, and this could have been a very memorable story. This show comes with the original mono soundtrack that fits the show just fine. The dynamic range is nothing to write home about, but the dialog is generally crisp and clear and there is no background noise, tape hiss, distortion or dropouts. There are optional subtitles in English. The full frame B&W image is impressive. The Restoration Team did an excellent job, really making the most of the 16mm prints that they had to work with. The image is nicely balanced and the definition and level of detail is very good. The contrast has been adjusted too to create a very pleasing image. The blacks are deep and inky and the whites are solid without blooming. This is an excellent looking picture. This disc is a bit light on bonus features, but the items included are generally very good. 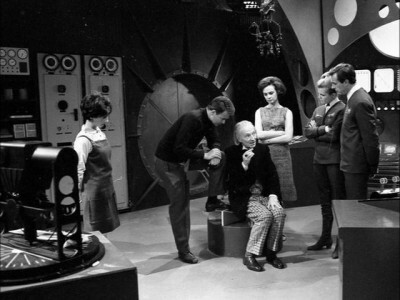 First off is a commentary track hosted by Toby Hadoke featuring (on various episodes) regular cast members Carole Ann Ford and William Russell along with actors Joe Grieg, Martyn Huntley and Giles Phipps, designer Raymond Cusick, make-up designer Sonia Markham, and the director of episodes five and six, Frank Cox. It's a lively group and Hadoke keeps the discussion moving for the most part. Naturally, it's hard to recall a lot of details after all these years, but there are some interesting tidbits revealed. It was interesting to hear Carol Ann Ford, for example, discuss what it was like to play a teenager as an adult. The video extras start off with a very nice piece, Looking for Peter. In this 21 minute featurette, Tony Hadoke goes in search of the mysterious writer of The Sensorites, Peter R. Newman. With only two writing credits to his name, and an equal number of years cited as to when he died, Hadoke has his work cut out for him. I started out thinking that this was a fluff piece they threw together to fill up the disc, but as it went on I became more engrossed in the mystery. It ended up being a very touching tribute. Well worth watching. In addition there is a pop-up informational text option which is very informative as always. It does give some dry statistics, like how many people viewed each episode, but there are also some interesting notes such as script changes that were made and background information on the supporting characters. The extras are rounded off with, a couple of photo galleries, and the listings from the Radio Times in .pdf format. This was a good adventure, with some great sets (especially for the early years of the show), a nicely expanded role for Susan, and a structure that keeps the six episodes just humming along. It's just too bad that the plot wasn't a bit more unique. Even so, it's an enjoyable story that fans of early Doctor Who should seek out. Recommended.